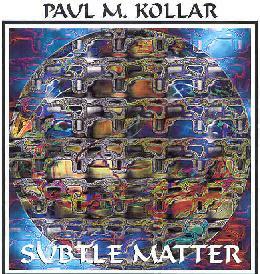 Paul M. Kollar - "Subtle Matter (The St. Elmo Loops)"
Before proceeding, do me a favor and read the St. Elmo's Fire review from AI issue #5. (CLICK HERE) Ok, read it? So now you know that St. Elmo's Fire was a King Crimson influenced progressive band from the late 70's. Paul Kollar played guitar, bass, keyboards, and tapes with the band, and due to his infatuation with the loop work that Robert Fripp was doing would open Elmo shows by performing his own music using a setup similar to what Fripp had been using at the time. All the tracks on Subtle Matter are improvisations taken from these performances and feature Kollar 'using the Fripp & Eno style tape loop system' playing guitars, organ, various synths, effects, and delays. Just for fun, after listening to this CD, and prior to writing the review, I dusted off my copies of Fripp & Eno's "No Pussyfooting" and Fripp's "God Save The Queen" just to get back into the original spirit of the thing. Now nobody respects Robert Fripp more than I do. But his guitar soundscape stuff gets a little tiresome after a while. Kollar has clearly learned well from the master and made this process his own. While tracks like "Point Blank", "The Ring And The River", "I Heard You Were Leaving", and "Subduction" incorporate the classic Frippoid looped sounds, most of the music on Subtle Matter focuses on pleasing ambience rather than what I consider to be the coldness of Fripp's soundscapes (Fripp probably does it deliberately). Tracks like "Subtle Matter", "The Ring And The River", and "Searching For Food" highlight majestic orchestral work with multiple keyboard lines that produce a mass of sound rather than focusing on melodies, though certainly the recognizable Frippoid guitar work is present. Another standout track is "She Painted Her Face", with its brain-piercing synth and soundscape guitar lines and sampled voices. This has really high-pitched synths that made me turn down the volume (headphones y'know). Kollar explores a world that straddles the line between floating Tangerine Dream styled-electronica and more abstract textures. Finally, "Subduction" features standard Fripp loops combined with freakier rocking guitar bits. Multiple layers of guitars make this one of the more complex tracks and the one I kept returning to. In summary, Kollar's music will appeal to those who enjoy Robert Fripp's guitar experimentations but feel he long ago took it as far as he could. I also think this is a good starting point for those who dig King Crimson and classic progressive rock, and are interested in the more abstract prog world yet want to wade in slowly. For more information you can email Paul Kollar at sprawling@hotmail.com.